This wry memoir tackles twelve different spiritual practices in a quest to become more saintly, including fasting, fixed-hour prayer, the Jesus Prayer, gratitude, Sabbath-keeping, and generosity. Although Riess begins with great plans for success (“Really, how hard could that be?” she asks blithely at the start of her saint-making year), she finds to her growing humiliation that she is failing—not just at some of the practices, but at every single one. What emerges is a funny yet vulnerable story of the quest for spiritual perfection and the reality of spiritual failure, which turns out to be a valuable practice in and of itself. Jana Riess reminds us that saints are different from most of us: They are special, we are barely normal. They get it right, we rarely get it. They see God, we strain to see much of anything. And, Jana is no saint. Rather than climbing to the pinnacle and sitting on a pedestal to tell us how it could be, Jana slides right next to us and reminds us that sainthood is overrated. With humor and insight she whispers to is that our lives matter just as they are. She prods us to never let our failures hold us back. She calls us to something greater than spiritual success - ordinary faithfulness. “Flunking Sainthood allows those of us who have attempted new spiritual practices-- and failed-- to breathe a great sigh of relief and to laugh out loud. Jana Reiss’s exposé of her year-long and less-than-successful attempts at eleven classic spiritual practices entertains and educates us with its honesty and down-to-earthiness. In spite of Jana’s paltry attempts at piety and her botched prayer makeovers, God showed up in the surprising, sneaky ways that only God does. Jana Riess is the author or editor of nine books, including What Would Buffy Do? Although she is a spiritual failure and was never able to climb the rope in gym class, she has a doctorate from Columbia University and teaches religion at Miami University. She blogs at http://blog.beliefnet.com/flunkingsainthood/. It's clear from the start of this sparkling and very funny memoir that Riess means well. But as she readily admits, she's a spiritual failure. She intended to devote an entire year ("a year-long experiment") to mastering 12 different spiritual challenges, including praying at fixed times during the day, exhibiting gratitude, observing the Sabbath, practicing hospitality according to the rules set by St. Benedict, abstaining from eating meat, and amply demonstrating her generosity. But nothing turned out as planned. Rather than being moved by Therese of Lisieux's The Story of a Soul, she instead dismisses the saint as a "drama queen." And Reiss is unregenerately practical. The best month to fast, she reasons, is February, at the height of winter; conveniently, it's also the shortest month of the year. Furthermore, at best, she's a "lukewarm vegetarian." Although her spiritual quest falls far short, she can still proffer spiritual lessons. Anyone who has failed to live up to expectations, which means most everyone, will love this book. When I first encountered the title Flunking Sainthood: A year of breaking the sabbath, forgetting to pray, and still loving my neighbor, I thought, “That sounds like me in my stumbling efforts.” I sensed I would find a kindred spirit in author Jana Riess, and I read this memoir hungrily. I enjoyed this book very much and could identify with the author’s longing to cultivate good habits and to deepen prayer life. I laughed aloud, and nodded my head in solidarity. I, too, have craved closeness with God, and tried many practices suggested by spiritual leaders. The chapter on praying the liturgy of the hours (or divine office) really struck home. I have been trying, unsuccessfully, to read morning psalms and then the compline prayer service at bedtime each day. Rather than feeling frustrated when I forget to do this, I enjoy the prayer time when it happens. After all, the quiet time is a gift to myself, and not an obligation in any way. The chapter on Benedictine hospitality sent me straight to the library so that I could reread the Rule of Saint Benedict. How I long to be able to live the instruction that “all guests who present themselves are to be welcomed as Christ, for he himself will say: ‘I was a stranger and you welcomed me. '” As Jana Riess experienced, it is not easy in our fast-paced culture to slow down and enjoy our unexpected encounters with people. 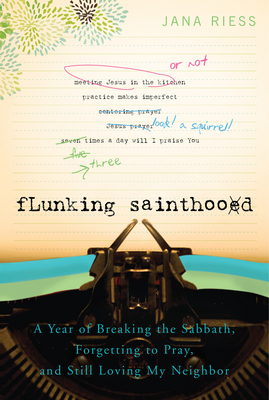 While I read Flunking Sainthood in two eager sittings, I appreciated that the book could be picked up once a month, taking one chapter at a time and trying a spiritual discipline alongside Jana Riess. For this reason Flunking Sainthood would make an ideal read for the start of the new year, when many of us try to adopt positive habits. Perhaps you long to try lectio divina, centering prayer, or a deeper sabbath observance. With Flunking Sainthood, you can enjoy the companionship of Jana Riess as you experiment and journey.